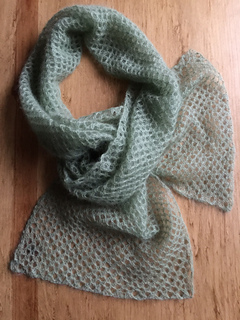 This simple rectangular lace scarf can be made in a variety of yarns and sizes and looks great on both sides. The lace can be worked over any multiple of 3 + 4 stitches. It will bias slightly, and for best results, use a needle one or two sizes larger than usually recommended for the yarn.